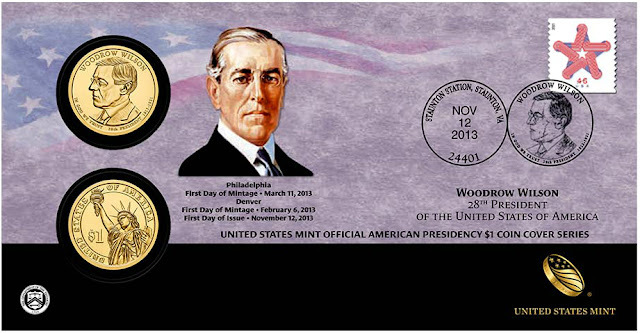 The 2013 Woodrow Wilson Presidential Dollar represented the final release of the year and the twenty-eighth release overall for the series created to honor the former Presidents of the United States. Woodrow Wilson had served as the president of Princeton University and governor of New Jersey before being elected President. He served for two terms during which the Federal Reserve Act was passed and America entered into World War I. He received the Nobel Peace Prize for his sponsorship of the League of Nations. 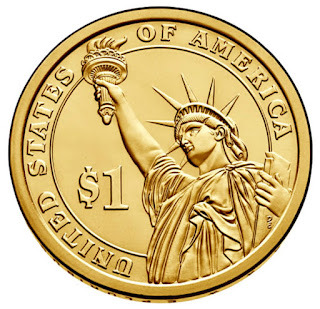 The obverse design of the coin features a portrait designed and sculpted by Don Everhart. 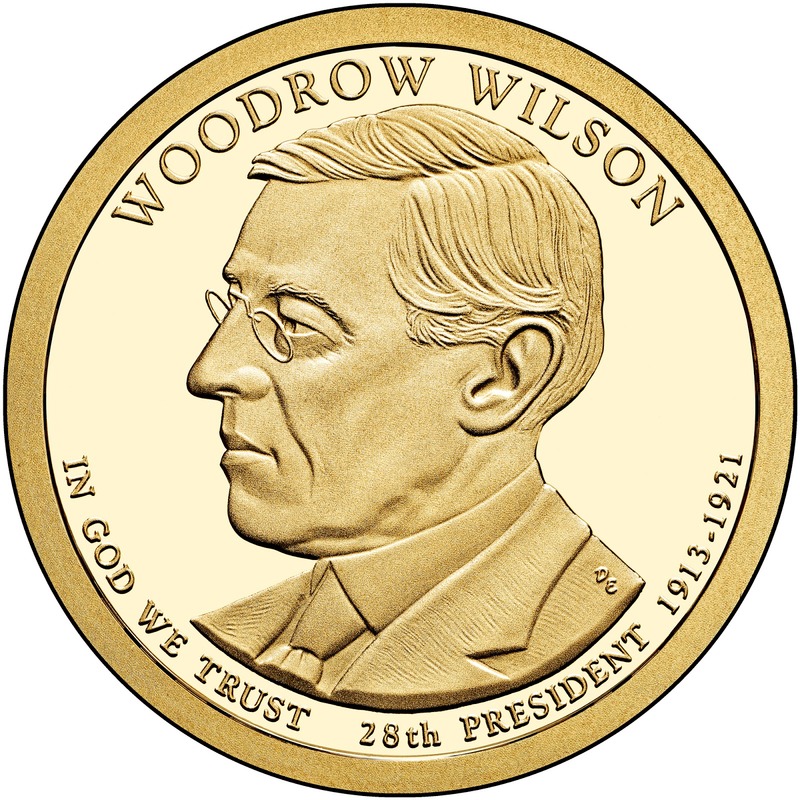 Inscriptions include “Woodrow Wilson”, “In God We Trust”, “28th President”, and “1913-1921″. 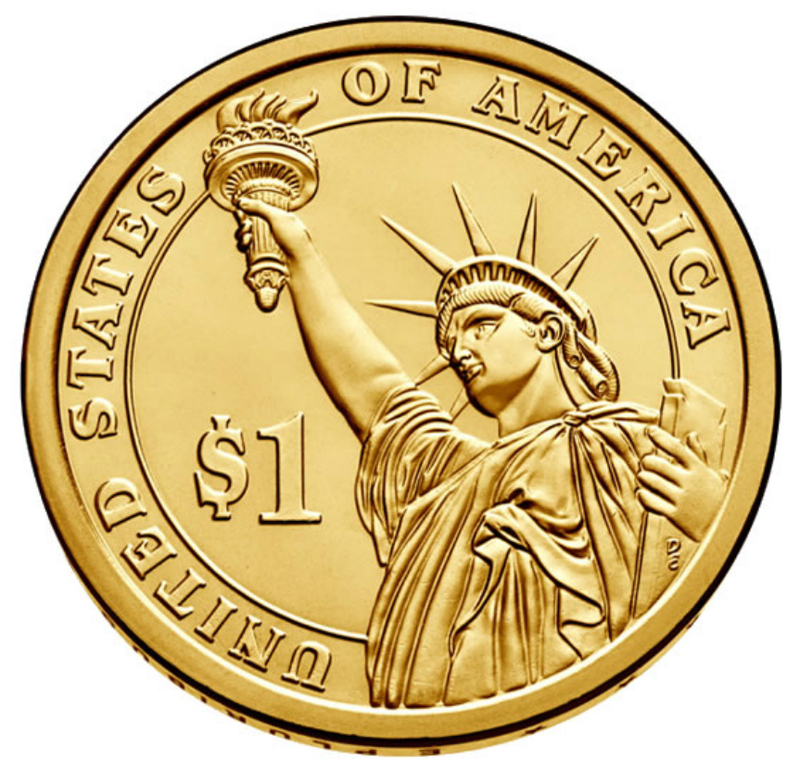 This design was endorsed by both the Commission of Fine Arts and the Citizens Coinage Advisory Committee, and officially selected by the Secretary of the Treasury. This was the only design for the series this year to receive the backing of both the CFA and CCAC. 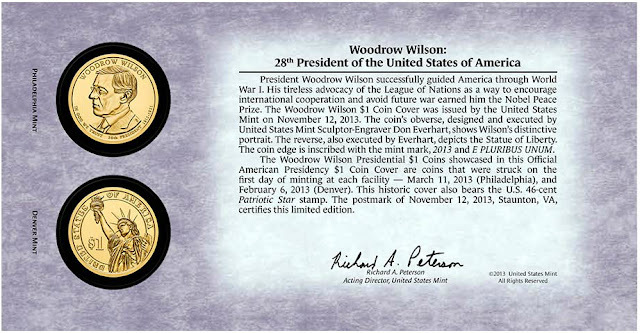 The reverse of the 2013 Woodrow Wilson Dollar features the rendition of the Statue of Liberty also designed and sculpted by Everhart. Inscriptions include “United States of America” and “$1″. The edge of the coin contains the date, mint mark, and motto “E Pluribus Unum” as incuse inscriptions. The United States Mint began sales of circulating quality examples of the Woodrow Wilson Presidential Dollars within rolls, bags, and boxes on October 31, 2013. These products were sold at prices which reflected a slight premium to the face value. Following a decision of the Treasury Department, the coins were not distributed to the channels of circulation. The coins were also included within various other numismatic products released throughout the year, including annual sets, Presidential $1 Coin sets, a coin and stamp cover, and a set including a First Spouse bronze medal. The production of circulating quality examples of the coin reached 4,620,000 pieces at the Philadelphia Mint and 3,360,000 pieces at the Denver Mint. The combined total of 7,980,000 pieces represented the lowest overall mintage for an issue of the series to date. Thomas Woodrow Wilson (December 28, 1856 – February 3, 1924) was an American politician and academic who served as the 28th President of the United States from 1913 to 1921. Born in Staunton, Virginia, he spent his early years in Augusta, Georgia and Columbia, South Carolina. Wilson earned a PhD in political science, working as a professor and scholar at various institutions before being chosen as President of Princeton University, a position he held from 1902 to 1910. In the election of 1910, he was the gubernatorial candidate of New Jersey's Democratic Party, and was elected the 34th Governor of New Jersey, serving from 1911 to 1913. Running for president in 1912, a split in the Republican Party allowed his plurality, just over forty percent, to win him a large electoral college margin. As President, Wilson was a leading force in the Progressive Movement, bolstered by his Democratic Party's winning control of both the White House and Congress in 1912. In office, Wilson reintroduced the spoken State of the Union, which had been out of use since 1801. Leading the Congress, now in Democratic hands, he oversaw the passage of progressive legislative policies unparalleled until the New Deal in 1933. Included among these were the Federal Reserve Act, Federal Trade Commission Act, the Clayton Antitrust Act, and the Federal Farm Loan Act. Having taken office one month after ratification of the Sixteenth Amendment, Wilson called a special session of Congress, whose work culminated in the Revenue Act of 1913, reintroducing an income tax and lowering tariffs. Through passage of the Adamson Act, imposing an 8-hour workday for railroads, he averted a railroad strike and an ensuing economic crisis. Upon the outbreak of World War I in 1914, Wilson maintained a policy of neutrality, while pursuing a more aggressive policy in dealing with Mexico's civil war. Wilson faced former Governor Charles Evans Hughes of New York in the presidential elections of 1916. He became the first Democrat since President Andrew Jackson elected to consecutive terms with a narrow majority. Wilson's second term was dominated by American entry into World War I. In April 1917, when Germany resumed unrestricted submarine warfare, Wilson asked Congress to declare war in order to make "the world safe for democracy." The United States conducted military operations alongside the Allies, although without a formal alliance. During the war, Wilson focused on diplomacy and financial considerations, leaving military strategy to the generals, especially General John J. Pershing. Loaning billions of dollars to Britain, France, and other Allies, the United States aided their finance of the war effort. Through the Selective Service Act, conscription sent 10,000 freshly trained soldiers to France, per day, by summer of 1918. On the home front, he raised income taxes, borrowing billions of dollars through the public's purchase of Liberty Bonds. He set up the War Industries Board, promoted labor union cooperation, regulating agriculture and food production through the Lever Act, and granting to the Secretary of the Treasury, William McAdoo, direct control of the nation's railroad system. In his 1915 State of the Union, Wilson asked Congress for what became the Espionage Act of 1917 and the Sedition Act of 1918, suppressing anti-draft activists. The crackdown was intensified by his Attorney General A. Mitchell Palmer to include expulsion of non-citizen radicals during the First Red Scare of 1919–1920. Following years of advocacy for suffrage on the state level, in 1918 he endorsed the Nineteenth Amendment whose ratification provided all women the right to vote by its ratification in 1920, over Southern opposition. Wilson staffed his government with Southern Democrats who believed in segregation. He gave department heads greater autonomy in their management. Early in 1918, he issued his principles for peace, the Fourteen Points, and in 1919, following armistice, he traveled to Paris, promoting the formation of a League of Nations, concluding the Treaty of Versailles. Following his return from Europe, Wilson embarked on a nationwide tour in 1919 to campaign for the treaty, suffering a severe stroke. The treaty was met with serious concern by Senate Republicans, and Wilson rejected a compromise effort led by Henry Cabot Lodge, leading to the Senate's rejection of the treaty. Due to his stroke, Wilson secluded himself in the White House, disability having diminished his power and influence. Forming a strategy for reelection, Wilson deadlocked the 1920 Democratic National Convention, but his bid for a third term nomination was overlooked. A devoted Presbyterian, Wilson infused morality into his internationalism, an ideology now referred to as "Wilsonian" — an activist foreign policy calling on the nation to promote global democracy. 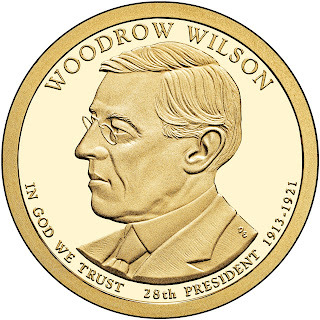 For his sponsorship of the League of Nations, Wilson was awarded the 1919 Nobel Peace Prize, the second of three sitting presidents so honored.